Who can remember life before Google?! Once upon a time, if you were looking for a job in Basingstoke you’d go to the yell.com website to search for a phone number…or maybe even scour the Basingstoke Gazette, community noticeboard, Thomson directory or Yellow Pages. These days, Google is so ubiquitous it’s basically become a verb. As a result of the increasing popularity and dominance of online search, people say “Google it” even when they’re referring to another search engine. It’s joined the ranks of Hoover, Velcro and Photoshop – brands names so strong that they’ve replaced the name of the product itself. Google now processes over 40,000 search queries every second on average and according to Candidate Source 30% of Google searches are employment-related. The rise of online search is rapidly changing the way people search for jobs. 75% of job seekers use search engines to start looking for their next job and instead of going to each job board independently, more and more job seekers are simply typing phrases such as “customer services jobs near me” or “full time jobs near me” into Google. Google have responded to the demands of online job seekers by allowing users to personalise their search accordingly. 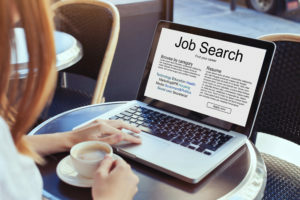 By entering specific search criteria, the job seeker allows Google to search business websites directly – as well as more traditional job boards – to find vacancies that may be of interest to them. Once the search is completed, job seekers can choose which method to apply through by clicking the relevant button. Amidst todays’ hectic schedules, the option to find the right type of jobs quickly and apply straight away has huge appeal (rather than then having to search on the individual boards which they have to register on). Users with a Gmail account can also set up alerts in a similar way to the job boards, so that they can be notified when new jobs that meet their criteria are posted. Once a job seeker has found the right job, Google Maps allows applicants to work out whether the company is a commutable distance. Tracking technology such as location settings on a smart phone allow candidates to get a better idea of practical considerations such as how long a commute would take them, and which mode of transport would be preferable. Whilst this smart technology cuts out a level of job searching for the candidate and makes it quicker and more focused, recruitment agencies and employers are having to improve their service to remain competitive. Job descriptions must be written in a way that will attract the right people, using the type of key words that are being used in the candidates’ online searches. Once contact with a potentially suitable candidate is made, recruiters must work harder to establish a relationship; showing support, communicating clearly, being flexible and responding quickly to all queries. When technology is moving at the speed of light, it really is a case of snooze, you lose. Are you recruiting for a job in Basingstoke? Wote Street People is a recruitment agency, here to help you find the right staff. Have a chat with us on 01256 799127 to find out more. If you’re a candidate looking for work in Basingstoke and the surrounding areas, please get in touch, 01256 799127 or email maxine@wotestreetpeople.co.uk.